Sorry for the late update since I was down with flu for several days. So lets get back to Java Mobile Programming :). As in the last post I gave some clue what are we going to learn in upcoming posts.I think last drawing example did work for everyone. In this chapter we are going to learn J2ME Low Level GUI in detail. J2ME Low Level GUI... Hmm when you hear this heading there is something that you all may ask. Is there a J2ME High Level GUI?...The answer is simply YES. Look at the picture I've put below. This explain the whole story. 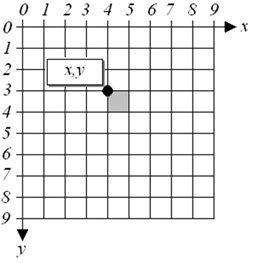 a game board, Graph etc. 1. Higher control on what is drawn on the Display. 2. Access concrete keys and other input devices. 3. Handle primitive events such as key presses and key releases. The Graphics and Canvas classes are used to directly access the Display and the Low level user interfcae API. Canvas class provide display surface, dimentions, and the developer has to overridden the methods of this class to paint the screen where necessary.The Graphics class provide methods to draw lines, rectangles, arcs, text and images. In my last example We have drawn lines and rectangles. The Canvas dimensions can be obtained through getWidth() and getHeight() methods so you dont have to wory about different screen sizes from different vendors. You need two classes for a J2ME low level GUI drawing. One for the MIDlet and other for the Drawing Canvas. Important things to notice in this example are, g.setColor(0xffffff); will set the colour of your drawing pen. We can set the colour in 0x000000 to 0xffffff or we can set the colour parameter in (R,G,B) Red Green Blue value combinations. example g.setColor(255,0,0); will set the colour into red. g.fillRect(0, 0, getWidth(), getHeight()); method will draw a rectangle starting from (0,0) coordinate values and the rectagle width and height will be the height of the screen. Important : Notice that (0,0) point is in the upper left corner in the display. You have to take this in mind when you draw things otherwise you'll get confuse. Practice those examples and try to use various methods availabel in Graphics such as drawArc(), fillArc() etc ... See you next time in another exciting J2ME lesson.